Outside we find the dépendance, which includes two double bedrooms, a bathroom with shower and a dining room with a lounge, an outdoor laundry area and outdoor furniture. The ground floor includes the living room with dining room and fireplace, kitchen, with double access, even from the outside, a bathroom and an internal laundry area. The first floor consists of three double bedrooms, all with their own exclusive balcony, one with a private bathroom with tub, one with a private bathroom with shower, while the third shares a bathroom with shower with a single bedroom. In the second floor/attic, we find a large master bedroom, with exclusive service with bathtub. 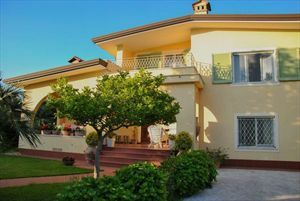 The Villa is also equipped with alarm system, air conditioning, automatic gate, Wi-Fi Internet connection, and parking space.